One great thing about the chill in the air this week is that I am enjoying these: pumpkin spice lattes. 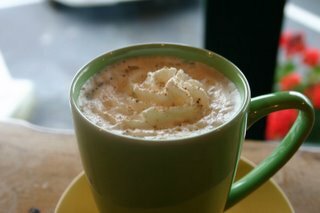 This is one from the Mandolin Cafe; this wonderful coffee shop near our house in Tacoma. It often bustles with people having great conversations, studying, writing, reading. Shhhh...my secret is that I have decided to tackle this: NaNoWrMo. I plan on spending a few hours a week writing at the Mandolin Cafe, drinking a few cups of coffee or tea.